3 2 S U P P L E M E N T T O O U T P A T I E N T S U R G E R Y M A G A Z I N E A U G U S T 2 0 1 5 H igh-quality intraoperative imaging lets surgeons navigate confidently around joints and confirm exact hardware placement during increasingly complex procedures. If you're looking to enhance the imaging capabilities in your ortho ORs, here are some factors and recent advances in C-arm technology you'll want to consider. 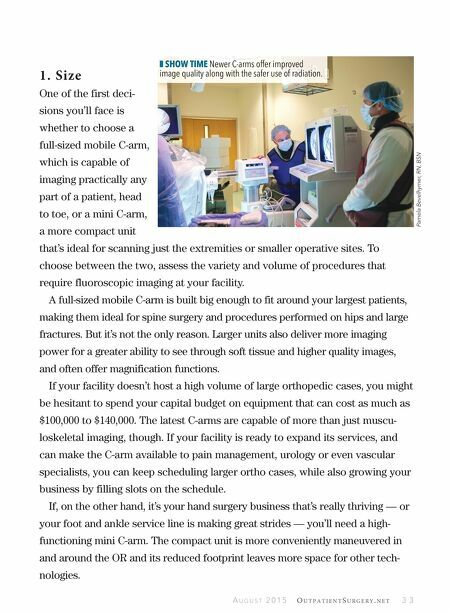 Are You Getting the Most Out of Your C-Arm? 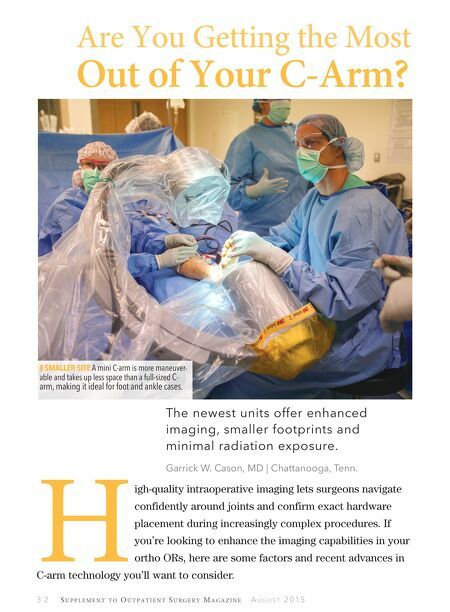 The newest units offer enhanced imaging, smaller footprints and minimal radiation exposure. Garrick W. Cason, MD | Chattanooga, Tenn. z SMALLER SITE A mini C-arm is more maneuver- able and takes up less space than a full-sized C- arm, making it ideal for foot and ankle cases.